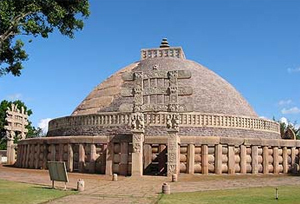 Meet on arrival at Bhopal Airport by our representative and transfer to the hotel. Rest of the day free for your own activity. Overnight stay at hotel. After breakfast drive to Khajuraho via Sagar. On arrival at Khajuraho check-in at hotel. Rest of the day free for rest. Overnight stay at hotel. Later drive to Orchha. On arrival at Orchha check-in at hotel. Overnight stay at hotel. After breakfast visit Orchha - Orchha is a small town placed on the banks of River Betwa and accurately translates to "hidden place "and is a well known traveler Destination. Orchha is residence to Bundella style of structural design and the palaces of Orchha bear observer to the magnificent work of medieval architects. The famous amongst this are Raj Mahal and Jahangir Mahal. The Raj Mandir - built on a square base has plain external with projecting windows. The Jahangir Mahal, built to welcome the Mughal emperor Jahangir is the magnificent example of Hindu structural design. The other attractions include the Raj Mahal, The Sheesh Mahal, the chaturbhuj temple. Along with these there are numerous Chhatris of royals or cenotaphs dotting the banks of the river Betwa. Later drive to Gwalior via Datia. Datia mentioned in Mahabharata as the Daityavakra. Datia is most famous for the 17 th century, 7 storey hilltop Palace of Raja Bir Singh Deo. Among its main historical monuments Do not miss to see the temple with Mughal frescoes and the Gopeshwar Temple. On arrival at Gwalior check-in at hotel. Overnight stay at hotel. After breakfast go for half day sightseeing tour of Gwalior and visit the majestic Gwalior Fort and Saas Bahu Temple. The Gwalior fort spreads out over an area of 3 square km, surrounded by concrete walls of sandstone. 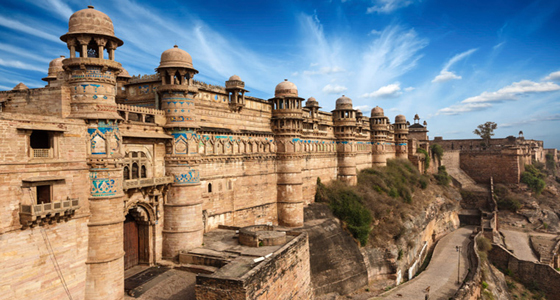 The Gwalior fort encloses three temples, six palaces and numerous water tanks. Sas-Bahu temple, or Sahastrabahu Temple, built by King Mahipala of the Kachchhapaghata dynasty is a beautiful temple in Gwalior. The temple is a marvellous example of architectural brilliance and the intricate designing is worth noticing. The entire temple is adorned with carvings and a beautiful idol of Brahma, Vishnu and Saraswati. Afternoon drive to Agra. On arrival at Agra check-in at hotel. Overnight stay at hotel. Later visit the Agra Fort which has the Pearl Mosque, Diwan-e-am (the hall of public audience) and Diwan-e-Khas (the hall of private audience). Afternoon drive back to Delhi. On arrival at Delhi transfer to Airport for your onward destination.